For some reason, I've never really been that into jewelry. On a daily basis, I wear my wedding rings and a chain necklace - tops. Heck, I don't even have my ears pierced! However, lately, I've been trying to step it up accessory-wise and have found that adding a pop of color (POC) here and there can really transform an outfit. Here's my current craze...neon necklaces! Love these ones from Ann Taylor. A bit of an investment, but classic in shape. 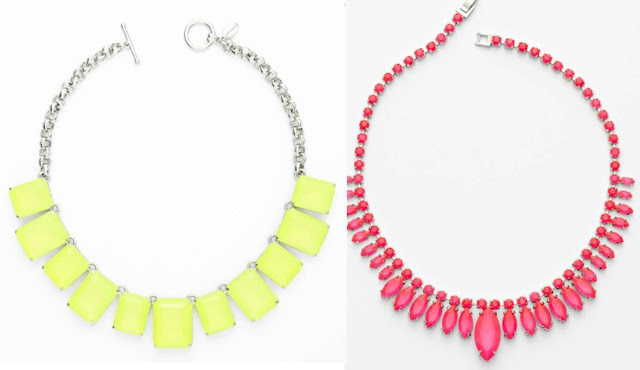 Three cute (and less expensive) options from Bauble Bar. And if you're really looking to save a pretty penny, you can always DIY! Krylon sells a variety of fluorescent colors that would work perfectly to recreate this look.